Last Thursday’s game against the Saints was a good start for the Patriots. They seem to be focused on creating a new history making season for their team. I had to agree with Belichick when I heard they had taken down poster/pictures of their old accomplishments. At this point those are definitely in the past and this team is capable of creating their own picture worthy moments, contrary to what some may be saying about the death of the dynasty. I went out to Foxborough yesterday to check out their training camp practice that was supposed to take place starting at 2:30pm. 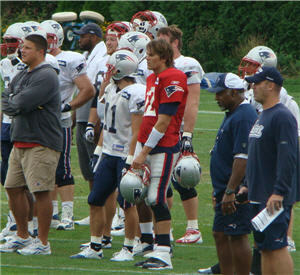 We got there at 2:00pm and they were already started in what seemed to be a pre-practice that included Tom Brady. Rumor among the crowd was that they had started early because of the threat of rain but even when some drizzle started they played right through it. Thankfully for the fans in the stands the rain did stop. The practice went for a solid 2 and a half hours and there were not that many smiles on the field. Tom Brady seemed particularly serious and focused. To the delight of the fans Wes Welker was out on the field and seemed to be totally participating in the practice. There are rumors that Tom Brady may have seriously hurt his hand at the game last Thursday. That may very well be true but his throwing arm did not seem to be affected at all as he zipped some throws around the field. There was one in particular that he zipped to one of his favorite targets Randy Moss that not many people can catch(he threw it so hard). Any injury that he sustained doesn’t seem to be affecting his throwing. If major injuries can be avoided I do not see why the New England Patriots would not be contenders for another NFL championship. In reality the win against the reigning champion New Orleans Saints doesn’t count as much as their apparent focus on the field. Belichick and Brady seem intent on proving something. That’s great news for Boston area football fans.